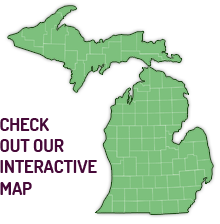 Watch the campaign take root as institutions ramp up their local food purchasing and report their progress through the Cultivate Michigan Dashboard. Need some inspiration? See the stories of Michigan farmers, processors, distributors and institutional buyers leading the way in supplying, sourcing and serving local food. The number of Michigan schools and districts buying local food directly from farms or through distributors has been growing. More than half of school food service directors now report purchasing local foods! More than 100 of Michigan’s nearly 150 hospitals have committed to locally sourcing 20% of their food by 2020 through the Healthy Food Hospitals initiative. Nearly half of Michigan vegetable farmers are interested in selling produce to institutions. Check out Demand & Supply to learn more about the latest Farm to Institution research and reports.